Buy Palladium: Cheap Palladium: Will We Continue to See Palladium Cheap? Cheap Palladium: Will We Continue to See Palladium Cheap? I'm pretty sure we won't find palladium cheap for much longer. It likely won't go much lower than what it is right now: $214. Now that's some cheap palladium! I said the same a few weeks ago when it was $220 and I'm still right. In fact, I wish I were wrong, though. I wish the price would go down to $100 so I can BUY MORE! I'm starting believe the prices really are manipulated because although it's hard to find there IS palladium available, but you definitely can't buy it for anywhere even close to the spot price of $214. Right now the people selling it for $330 are the ones with cheap palladium! If you call up a big seller they will sell it to you for around $260 or so, with a minimum of 5 or 10 ounces. On Ebay it's still for sale, but they are listed for $400, and more--and selling for that! So, there is a shortage, and people who have the coins or bullion are selling them for at least $50 over spot. So, is the cheap palladium really worth $214 and an ounce, or is it worth more? To me it's worth more; I paid $300 when it was worth $240 because the only other cheap palladium options would have been to buy 5 ounces; and I didn't want to spend that much at the time. And if you walked up to me I wouldn't sell you my palladium coins for any less than $350, because it would take around that to replace it. How the palladium bullion and coins are selling for double spot is WEIRD! And what about gold vs. palladium? Gold 1 oz is way up over $900 and platinum prices, palladium, and even silver prices are extremely LOW! So, we know they're going up eventually, and we know now's the time to invest. I'm new to the palladium market, but my guess is that gold moves first, by a certain percentage, then silver and platinum follows by a slightly larger percentage, and then palladium. Am I right? 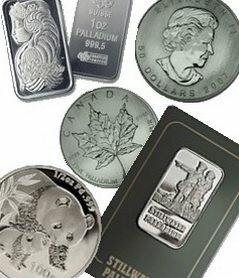 I'm baffled by all three: cheap palladium as well as cheap platinum and silver...and also for them not selling that low! Weird. But, it's cheap palladium so if u want palladium cheap now is your time to buy! My family unearthed a 500kg slab of palladium and we want to sell it but we don't know any buyer. I have been surfing the net for buyers but most advertised buyers only buy coins and bars. Do you know any buyer? I am from the Philippines. Sir, sorry to bother you, but would you please delete the previous comment here and this too. It was a very stupid thing to say.